Each week, I'll be preparing you for the Patriots upcoming opponent with a scouting report, going over the opponent's roster with a focus on how they will specifically match up with the Patriots. This week, the Pats have no time to linger over Sunday's disappointing loss, as they take the field tonight for a nationally televised showdown with the 2-1 Bucs. The Pats will have to buckle in for this one; not only are they on the road on a short week, but they're facing an explosive offense loaded with passing game playmakers. How will the Patriots struggling defense manage to survive this one? Keep reading for that and the rest of the matchups that should play out on the field tonight. Patriots fans have every reason to fear the matchups on this side of the ball, as the 2-1 Bucs come with an explosive passing offense. They rank 12th in the league in scoring (23.7 points per game) and are in the top 10 in most major passing stats, including yards (833, 3rd), touchdowns (6, 3rd) and net yards per attempt (7.3, 5th). Those counting stats are particularly impressive because the Bucs have only played three games thanks to a Hurricane Irma mandated Week One bye. Just looking at the names on the offensive roster makes it obvious why the Bucs have faired so well in the passing game. They have a very talented young signal caller in Jameis Winston and they’ve surrounded him with tons of weapons. With this kind of top end talent present, it would be stunning if the stats weren't gaudy. Of those weapons, starting receivers Mike Evans (#13) and Desean Jackson (#11) are the most dangerous. While the Bucs two stars are distinctly different receivers, both are dangerous vertical threats capable of making a game changing big play on any snap. They are largely the reason the Bucs rank third in yards per completion with 12.2 (only your Patriots and the suddenly resurgent LA Rams outpace them in that category). The 6’5”, 231 pound Evans has been the more productive of the two this season, reeling in 19 of his team leading 32 targets for 227 yards (11.9 per catch). He uses his borderline tight end size both to bully smaller defensive backs on intermediate routes and to out jump them for contested balls down the field. A former basketball player, Evans is like a rebounder in the red zone, using his frame to box out defenders before high pointing Winston’s jump ball throws. 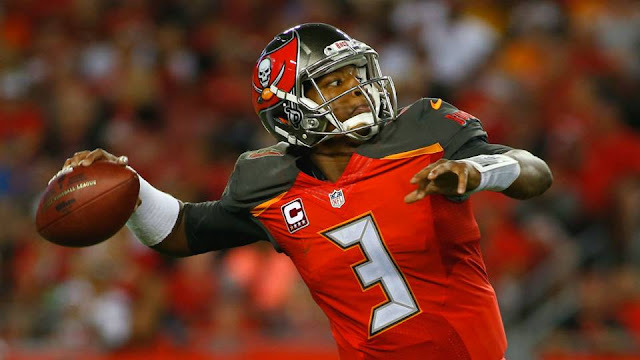 The gunslinging Winston will throw jump balls Evans’ way even against tight coverage, displaying justified confidence that his star will come down with the ball if he just gives him a chance to go up and get it. While Evans outmuscles and out jumps defenders from his long balls, the electric Jackson uses pure speed to simply run past his coverage. Jackson has long been one of the leagues most explosive deep threats and continues to be just that, averaging 15.9 yards per catch in this still young NFL season. Winston and Jackson have actually had some struggles getting on the same page in their first season together, as Jackson has caught only 9 of his 20 targets, a catch rate of just 45%. Still, the Patriots know what Jackson is capable of separation-wise: in addition to his world-class speed, he has explosive quickness that makes him an ankle breaker both as a route runner and as a ball carrier after the catch. The Bucs will give him the occasional manufactured touch (reverse, WR screen, etc) to take advantage of that big play explosiveness after the catch. Even during a down start to 2017, his presence on the field has affected coverage, as the deep safety in any defense has to be aware of Jackson’s whereabouts on every play just in case he leaves his corner in the dust. The slot is manned by the underrated Adam Humphries (#10), who has quietly developed into one of the league’s better players at his specialized role. Humphries has followed up his breakthrough 2016 season with a productive start in 2017, catching 14 balls for 156 yards (11.1 per catch) through three games. At 5’11” and 195 pounds, Humphries has the build and skill-set of a classic Patriots slot, using his quickness and precise route running to quickly gain separation against defenders inside. Humphries gives the Bucs an excellent top three at receiver, with rookie Chris Godwin (#12) serving as the “next man up” should something go awry on game day. A size/speed prospect (6’1”, 209) drafted in the third round this spring, Godwin impressed in the preseason but has played sparingly thus far with Evans, Jackson and Humphries all staying healthy. As dangerous as it is against these kind of playmakers, I think the Patriots will have to use more man coverage against these guys than they have in recent weeks. With Eric Rowe already ruled out due to a groin injury, the Patriots will roll into this one with Stephon Gilmore, Malcolm Butler and Jonathan Jones as their top three corners. Neither Butler (5’11, 190) nor Jones (listed at a generous 5’10” and 190) have the size to hang with the monstrous Evans. Butler’s struggles with size were prominent last week against the Panthers, as the bigger Devin Funchess was able to bully him around on several noteworthy occasions. If the Patriots go with another zone heavy approach, the Bucs will be able to use motion and formations to create size mismatches against Butler and Jones with Evans, just as the Panthers did with their supersized duo of Funchess and Kelvin Benjamin. If the Pats do use more man coverage, the individual matchups for their corners make logical sense skillset wise. The Patriots paid current fan and media punching bag Stephon Gilmore all that money precisely because he was one of the rare corners with the size, length and athleticism to match up in man with elite big receivers like Evans. Butler would likely spend time against both Jackson and Humphries, with Jonathan Jones taking one of those two in three receiver sets. I could even see the Patriots tapping into Jones’ 4.3 speed by putting him on Jackson at times, using Butler’s pure coverage ability to counter the precise route running of Humphries when the Bucs go three wide. Whoever draws Jackson will likely get some form of safety help over the top due to his deep speed. This is a game where we’ll probably see plenty of “big nickel” three safety personnel, as there’s multiple weapons here who require extra coverage help. While man coverage would also help to hopefully cut back on the communication breakdowns that have plagued four ugly defensive outings in a row, no strategy is without its flaws and risks. For the Patriots, the top end talent on the outside isn’t the only reason using more man will be dangerous. The matchups are also problematic on the inside, where the Patriots lack top coverage options. 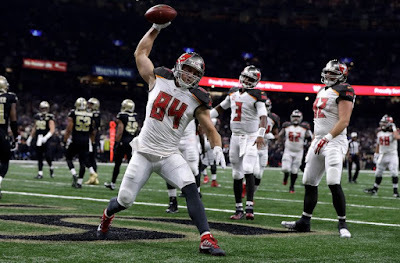 The tight end position is well stocked, with veteran Cameron Brate (#84) and first round rookie OJ Howard (#80) forming an excellent one-two punch. The rookie from Alabama has been on the field more due to being the preferred option as an in-line blocker, a role in which he’s been pretty good right off the bat. Despite his impressive athleticism, he’s been seldom used in the passing game, with just 8 targets through three games. A 58 yard touchdown against a Patriots-esque coverage bust represents the vast majority of his passing game production so far. Still his speed is not to be triffled with, making him a dangerous threat on crossers, seams and other routes that allow him to get a head of steam going. Meanwhile, Brate is a passing down specialist who has emerged as one of Winston’s most trusted guys in critical situations and the red zone. Brate is another guy who has followed up a 2016 statistical breakthrough with good play so far this year, catching 10 of his 13 targets for 137 yards (13.7 per catch) and two touchdowns. While not a physical freak, Brate is a good enough athlete and route runner to be a tough cover for linebackers. He has a knack for finding the soft spots in zones and has the concentration and size to go up and make contested catches, even when a crushing hit is imminent. Brate’s route running makes him a likely matchup for Patrick Chung when the Pats go into man coverage. A few years ago, I’d say that matchup would favor Chung. Today in 2017, I’m not so sure, as Chung hasn’t looked great in coverage since his career 2015 season. He’s still a better option than backup Jordan Richards or top coverage linebacker Kyle Van Noy. In this case, the Pats will have to take their chances with him in this matchup due to a lack of alternative options. Those box safeties and linebackers will also get tested by the Bucs running backs out of the backfield. The downfield looking Winston doesn’t utilize his backs as checkdown options all that often, targeting them a combined 8 times thus far. 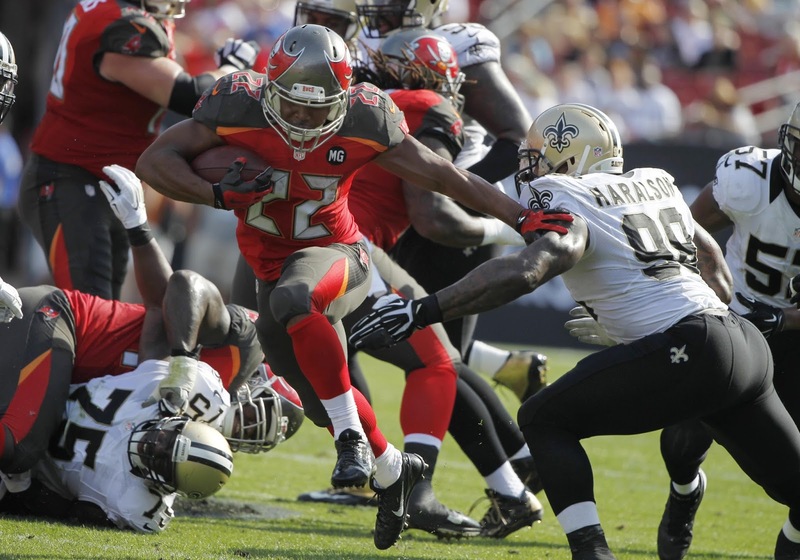 However, he does have two capable passing down backs at his disposal in Jacquizz Rodgers (#32) and Charles Sims (#34). A 2014 third round pick, Sims has been injury-prone in his career but he's one of the games better pass catching backs when healthy. Like his fellow 2014 draftee James White, Sims is used almost exclusively in passing situations. That separates him from Rodgers, whose balance and vision helps him overcome a lack of size (5’6”, 206) to be a serviceable option between the tackles. Rodgers averaged 4.1 yards per carry during the Bucs first three games, when he was the de facto lead back in the absence of the suspended Doug Martin. How much work will Martin get in his first game of 2017? That suspension is up, leaving it up in the air how the Bucs will divvy up the carries in their first game with their top ball carrier. He prefers to go by Doug Martin (#22) rather than the Muscle Hamster, but he's is clearly the Bucs most talented runner regardless of what you call him. When he’s been healthy, in-shape and motivated, he’s been a beast, with two 1,400 rushing yard seasons in his five seasons. The problem has been inconsistency, as he’s looked sluggish in his other three seasons, with injuries often a factor. He’s coming off of a down 2016, as he only played eight games, and was never the same after suffering a severe hamstring strain. However, he drew raves all offseason for his physical fitness and explosive burst, something that he flashed in the preseason. It remains to be seen how much work the Bucs will give him in his first game of the season, but he’ll come in healthy, fresh and presumably with the kind of burst he last showed in his dominant 2015 season. If Martin can look like that guy again, this Bucs offense gets much tougher to defend. Their passing game weaponry suggests that this could be a dime-heavy game plan, with the Patriots attempting to get as much cover talent on the field as possible to counter. With a healthy Martin, the Bucs should have a counterpunch to exploit those lighter personnel packages up the middle, where the 5’9”, 223 pound Martin is a hammer. Establishing the power running game with Martin would also help to open up play action, which should only help the downfield passing game that already is the strength of the offense. My guess is the Bucs give Martin his share of touches, but use a committee to avoid over working a back who hasn’t experienced game conditions in over a month now. Rodgers would likely be the main guy cutting into that workload, as his slashing style and explosiveness make him a nice change of pace from Martin. Peyton Barber (#25) rounds out the backfield, giving the team another big bodied power option to back up Martin on early downs. All of this skill position talent is at the disposal of Winston, who is one of the game’s top young quarterbacks despite seeming like theres still plenty of room for development at times. Winston has a bit of Farveian gunslinger in him, a quality that leads to plenty of explosive plays but also his fair share of head scratching decisions to throw into coverage. Thats evidenced in his six touchdowns and three interceptions, both of which are high totals for only three games played. His willingness to hold on to the ball leads to some impressive extended plays, but he’ll also occasionally take major risks trying to make a play when the safer call would be to get rid off it and live for the next down. The possibility of forcing turnover worthy throws makes this a game for the defense to be a little more aggressive in the pass rush. Three of the Pats four matchups have called for a more cautious rush approach to counter the quarterback’s running ability. This week, the Pats finally face a traditional pocket passer after struggling to contain the rushing threats of Deshaun Watson and Cam Newton in back to back weeks. Winston has the improvisational ability to slip tackle attempts and make the occasional play with his legs, but he lacks the pure speed to pose a Newton like threat as a runner. He’s rushed six times through three games for only 19 yards, with a long of 8. Pressuring Winston wasn’t a tall task until 2017, when a much maligned offensive line has improved into one of the league’s better units through the season’s opening month. Health has been key here, as healthy returns from right tackle Demar Dotson (#69) and right guard JR Sweezy (#73) has stabilized that side of the line. Dotson has looked like the ascending player he was prior to blowing out his MCL in the 2015 preseason. Now two years removed from that injury, Dotson is currently ProFootballFocus’ 3rd ranked tackle, earning high marks for both his protection and run blocking. Sweezy was a high priced free agent signing in the 2016 offseason, but he’s been making his first regular season appearances for the Bucs this year after missing all of last year with a nagging back injury. Sweezy is a brawler who brings some needed nastiness up front; at his best he’s a punishing finisher in the run game. With Sweezy back at guard, the Bucs have moved 2015 second rounder Ali Marpet (#74) to center, with largely positive returns. An above average athlete for the interior with some nastiness to his game as well, Marpet’s smarts have made him a stabilizing presence at the pivot. Things have less stable on the left side, where they continue to trot out Donovan Smith (#76) at left tackle. The third year man was drafted 34th overall in 2015 with the intentions that he’d develop into their left tackle of the future. However, at a point his career when most prospects make the leap to the next level, Smith continues to look lost in his third season, earning brutal marks from PFF. The guard spot next to him has been filled by a rotation of Evan Smith (#62), a veteran best known for his time as starter in Green Bay and 2014 fifth rounder Kevin Pamphile (#64), with the elder Smith putting the better play on film. Despite the struggles of Smith, the line has been considerably better this year than years past, when they allowed consistent pressure on Winston. In fact, only the consistently great lines of the Raiders and Eagles have allowed fewer pressure on a per snap basis than these new and improved Bucs. Both Dotson and Marpet rank amongst the top five amongst their position in that metric individually. 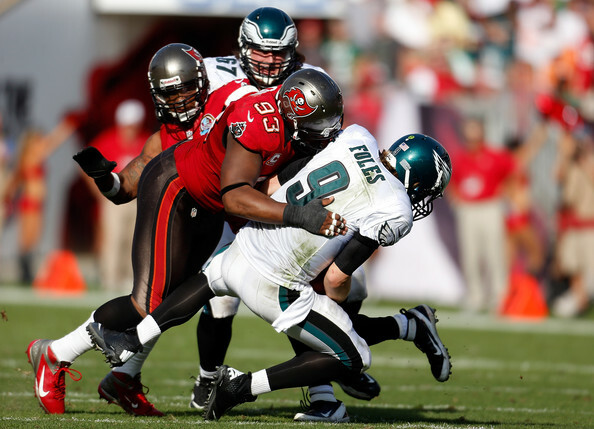 Despite the Bucs recent success in protection, the Pats will have to find a way to overcome that strength. Allowing Winston to stay unmolested in the pocket is football suicide given the weapons he has at his disposal: one of them will eventually get open no matter how strong the coverage is. Whether it be through scheme-created confusion (stunts, twists, etc) or continued strong play from the likes of Trey Flowers and Deatrich Wise, the Pats have to find a way to pressure Winston. It's likely the defense's only chance of slowing this imposing offense down. After the doom and gloom of pretty much all of the above words, we can return to some positivity on this side of the ball. As good as the Bucs have been offensively, they've been nearly as bad defensively in 2017, particularly against the pass. In fact, only your Patriots have been worst statistically, as tonights game pits the only two teams to surrender over 300 yards passing per game against each other. Its been a disappointing turn for a young defense that looked like it was developing into a good unit during an impressive second half of 2016. Their struggles against the pass have overshadowed dominant play against the run. Only the Broncos have been stingier on the ground than these Bucs, who come into today allowing a measley 2.9 yards per carry. Some of that can be written off due to game script, as the Bears were forced to abandon the run early against them due to facing a quick deficit. Some can be attributed to competition level, as they just fattened up those stats against the inept Giants rushing attack. But still, you don't hold opponents to 2.9 yards per carry without excellent play from your front seven and defensive line in particular. That defensive line is led by Gerald McCoy (#93), who has quietly turned himself into one the league's most disruptive defensive players. McCoy has dominated year in and year out in the relative anonymity of Tampa ever since becoming the third overall pick back in 2010. At 6'4" and 300 pounds, McCoy is actually smaller than your typical star defensive tackle, but he combines his incredible get off from the line with excellent technique and hand usage to consistently penetrate through his blocking into the backfield. As a result, McCoy is equally disruptive against the pass and run, earning himself the second highest grade amongst interior lineman from PFF so far. While McCoy typically wins with quickness rather than brute strength, the rest of the interior is a rotation of bigger bodies meant to occupy blockers and clog up gaps up front. Veteran Chris Baker (#90) is nominally the starter opposite McCoy, but it's been an almost even rotation between him and former Seahawk Clinton McDonald (#98) when everyone's healthy. That's a bit surprising given Baker's high level of play in previous seasons with the Redskins, play which earned him a nice contract to lure him to Tampa this spring as a free agent. At his best, Baker is a big (6'2", 320 pounds) physical presence in the middle who requires multiple blockers to move him from his spot. 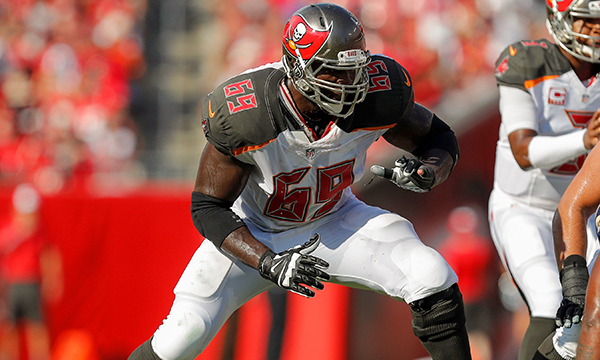 McDonald enters the fourth and final season of the contract he signed with Tampa as free agent back in 2014. He's been a solid if unspectacular rotational piece over the life of that contract, remaining at that level in 2017. The interior rotation is rounded out (pun intended) by old friend Sealver Siliga (#96), who got most of his 2017 playing time in Week 3 when Baker was out due to injury. Not only due the Bucs have an ample supply of big bodies to clog the middle, but they've also gotten good play out of their edge setters against the run. The edges are typically manned on early downs by veterans Robert Ayers (#91) and William Gholston (#92), with both earning strong marks for run defense from PFF. Ayers has had a particularly interesting career arc. A first round pick by Josh McDaniels' Broncos in 2009, Ayers was prematurely derided as a bust after a slow start to his career, but went on to slowly develop into an excellent player. Now at age 32, he remains productive, earning strong marks from PFF for both his work setting the edge and as a pass rusher. Gholston on the other edge doesn't offer much as a rusher, but uses his long arm and brute strength to set a tough edge. The run defense is also aided by the range of their linebackers. The Bucs are actually down two starters on the second level, with studs Lavonte David and Kwon Alexander fully expected to miss another game tonight with injuries. However, the Bucs have been able to survive the loss of not one but two top end starters here thanks to the emergence of rookie Kendell Beckwith (#51). A third round pick from LSU, Beckwith has been a revelation this season. He currently owns PFF's 7th highest grade for linebackers, as he's used his athleticism to fly around the field and make plays, just as David or Alexander would. His speed makes him one of the league's more capable linebackers in coverage, an essential skill in Tampa's zone schemes, but it's been his anticipation and physicality against the run that has surpassed his rookie expectations. Look for him to be an every down linebacker with David and Alexander out of the lineup again. The depth has been tested more in the spots next to Beckwith. Adarius Glanton (#53) will join Beckwith as a full-time starter. A UDFA from 2014 who has stuck around as a depth guy through three seasons with the Panthers and Bucs, Glanton has gotten a chance to play by far the most significant snaps of his career this season. At 6'1 and 230 pounds, he's a bit undersized and get muscled out of running lanes when blockers get their hands on him. However, he's another well above average athlete for the position, which has shown up with solid pass coverage. 2016 sixth round pick Devante Bond (#59) will join those two as the third starter in base packages, as he made his first career regular season snaps last week after missing all of his rookie year with a nagging hamstring injury. The athletic but undersized Cameron Lynch (#52) is the last man left on the depth chart and will be the next man up should the Bucs get hit with another linebacker injury tonight. The common thread amongst this linebacker group is speed, even down elite starters like David and Alexander. There's a clear emphasis of speed and range over size and power by this Bucs front office. These guys aren't necessarily the best at shedding and defeating blocks, but they count on the big guys up front to keep them clean, allowing them to range from sideline to sideline and clean up plays. It's a strategy that has allowed them to remain stout against the run even as the linebackers have been hit with injury after injury. While this front seven has been good against the run, their pass rush has been virtually non-existent. Their edge rotation goes three deep in passing situations, with Noah Spence (#57) and Ryan Russell (#95) joining the veteran Ayers. Both Spence and Russell have been used more as pass rushing specialists, but neither has brought much to the table in that department. Spence was a highly touted pass rushing prospect in last years draft, but he's been plagued with shoulder injuries in his short career. He managed 5.5 sacks last year as rookie gutting through a torn labrum that required offseason surgery and now finds himself playing through a separated shoulder. As a result, he's yet to truly unleash his pass rushing upside, which had many projecting him as a first round talent in his draft class. Despite those nagging injuries, he's still been more productive than Russell, who has done little of note despite 81 pass rushing snaps in three games. The 2015 fifth round pick has done little of note in his career, failing to make the Cowboys last year despite suspensions and injuries creating an opportunity for playing time at his position. The failure of those two to consistently win matchups on the edge can be largely blamed for Tampa's anemic results rushing the passer. McCoy has been his usual disruptive self and Ayers has been solid, but they've been the only two to consistently make plays as pass rushers. The team's generated very little pressure as a whole, with Spence responsible for their only sack in those three games. That lack of a pass rush has been a factor in their poor pass defense, as opposing quarterbacks have been able to get comfortable in the pocket against these guys. That's never a good thing when the secondary is struggling. Speaking of that secondary...hoooooo boy. Things have not been good on the back end of this defense and they could get worst this week with injuries also piling up at the safety position. They were already down TJ Ward thanks to a hip injury, and now will be without starting free safety Keith Tandy thanks to hip injury suffered in Sunday's win over the Giants. That's a tough position to lose a starter at, especially going against the vertical passing game of the Patriots. 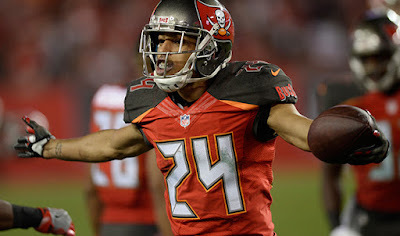 The Bucs do have one strong corner in the ageless Brent Grimes (#24), who remains one the league's best zone corners despite a lack of size (5'10", 185) and an abundance of age (34). Grimes has made a living this long in the NFL thanks to his elite ball skills. He excels at playing underneath his receiver on the sidelines, at times even baiting quarterbacks to test his coverage, before using his unique knack for locating the ball to come up with passes defensed and interceptions. Tom Brady won't be scared to look his way, but he'll have to be careful, as Grimes more often than not comes up with the ball when an inaccurate or ill-advised pass gets sent his way. The rest of the corners have not fared as well. Vernon Hargreaves III (#28) is an electric talent who was taken 11th overall in last season's draft, but he's been burned frequently so far in his sophomore season. 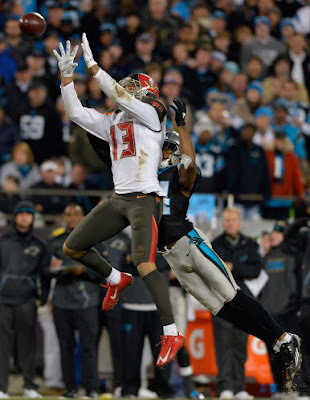 Hargreaves flashes the athleticism to become a top cover corner, but inconsistent technique has led to breakdowns and big plays against his coverage. At 5'10" and 204 pounds, he's another smaller corner that can be bullied by bigger receivers. The slot is manned by former Patriot Robert McClain (#36), a journeyman who surprisingly failed to make the 2015 Patriots out of camp. McClain has gotten his hands on a few balls, with two passes defensed and a pick six through three games, but he's also been beaten quite a bit as well. The next man up should anything happen injury-wise at corner would be Ryan Smith (#29), a fourth rounder from a year ago whose contributions have come almost exclusively on special teams so far. At safety, the injury to Tandy will likely result with second round rookie Justin Evans (#21) making his first career start. The Texas A&M product has played sparingly so far as rookie thanks to the presence of veterans like Tandy and Ward in the lineup. Evans is a top notch athlete with range for days, but discipline was a knock on him as a draft prospect. He made plenty of big hits but also missed a lot of tackles in college. More importantly, his lack of experience should make him an easy target for Brady, who is a master of manipulating coverages pre-snap. Play action could be a weapon against the inexperienced players the Bucs will be playing in the middle of their defense (you can add Beckwith and Glanton to that category alongside Evans) and Brady could have a play or two where he moves the rookie free safety with his eyes, opening a throwing lane elsewhere down the field. Strong safety will be manned by veteran Chris Conte (#23). A seven year veteran, Conte figured to get squeezed out of the starting lineup with the acquisition of veteran star Ward, but Ward's injury has helped Conte retain his job. His pedestrian play this season has done little to excite Bucs fans, as he continues to be a mediocre at best coverage option. It remains to be seen how healthy Rob Gronkowski is after the big tight end was a late addition to the injury report, but even an 80% Gronk should be able to dominate Conte, who at 6'2" and 203 pounds is at a severe physical disadvantage in that matchup. Simply put, there's a lot of talent mismatches and inexperience for Brady and the Pats passing game to attack here. If the Patriots line can protect Brady against the Bucs underachieving pass rush, there should be plenty of opportunities for big plays down the field. They'll mix in a run or two to create the illusion of offensive balance, but this is a matchup to look for Brady to spread the Bucs out and mercilessly attack their mismatched secondary. This very well may turn into a shootout, but I do like Brady's chances to push for 35+ points against this injury battered unit. The Bucs have been pretty good on special teams through three weeks, with the noteworthy exception of placekicker Nick Folk. The Bucs placekicking competition became a national storyline this summer, as veteran Nick Folk (#2) beat out youngster Roberto Aguayo just a year after the Bucs traded up in the second round to secure the Florida State kicker. Folk won the job despite his own unconvincing preseason performance, and he's missed two extra points and two field goals in just three games so far. 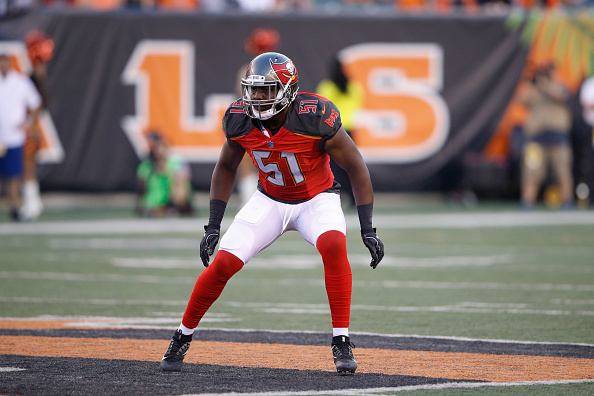 The Bucs justifiably have little confidence in him, which will factor into their playcalling at times tonight. Everywhere else, they've been solid. Bernard Reedy (#18) has come out of no where to secure top return duties on both punts and kickoffs. He's averaged 11 yards per punt return and has a 50 yard kick return on his resume already in this young season. The Bucs have also been solid at covering both punts and kickoffs, allowing just 5 yards per punt and 21 yards per kick return. They can thank the solid directional punting of Bryan Anger (#9) along with strong special teams play from the likes of reserve defensive backs Josh Robinson (#26) and Ryan Smith.